I was able to attend the annual TEPR show this week in Dallas. TEPR has attempted to differentiate itself by focusing on the quality/quantity of its educational sessions and not so much on the booth presence. It is hard to compete with the booth excesses of HIMSS anyway, so I believe this is probably a good strategy. I would suggest to TEPR that they also move the conference to later in the year, and get at least six months of separation from HIMSS. As part of the conference, I was invited to share my ideas as the keynote for the 1/2 day open source track. Many of the usual suspects were there (Will Ross from Mendicino Informatics, Dave Ulhman from ClearHealth, and Tom Jones from Las Vegas (er, Tolven) along with some new faces who were actually using the software in practice. 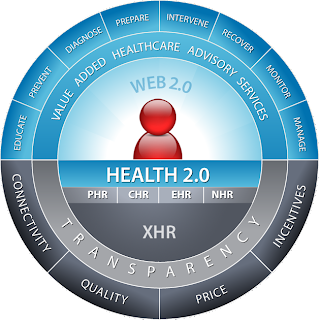 The title of my presentation was, “Health 2.0: The Enabling Technology and the Reform Agenda for Next Generation Healthcare. Graphic conceived by Scott Shreeve, MD and created by Hemeon Design. Copyrighted CrossOver Healthcare. Distributed under the Creative Commons NC-Attrib 2.5 License. This title was specifically chosen to highlight my notions of Health 2.0 being much more than the underlying technology and equally about the health care reform movement as well. As part of that, I have updated and modified by canonical representation to include Web 2.0 as part of the consumer centric experience. I have also incorporated the concept of the pervasive XHR that serves as the source of aggregation across the continuum of care and is immediately accessible by all approved parties in a private, confidential, and secure way. This has added further clarity to my thinking regarding the subject. As I have mentioned previously, writing and giving presentations serves as a forcing function for me. Social media tools, such as blogging, allows a wider net to be cast in gathering opinions and critiques of ones work.I would welcome feedback to continue to refine these concepts.